Some fluff based on a small 500 points game I had the other day, involving my Empire soldiers against a band of Ogres. My army list consisted of a warrior priest (WP) 30 halberdiers (H), 10 crossbowmen (C) and 5 knights (K). My opponent's list included 5 bulls (OB) led by a Bruiser (B), a unit of 20 gnoblars (G), and two Mournfang Cavalry (MC). Hope you guys enjoy reading ! Sergeant Lars Kreyser was beginning to take a profound dislike to the warrior priest at the head of the column. The bald, red-bobed man had marched into burgermeister von Kasten's office the night before, demanding military aid on what he called "the persecution of the wicked", or some such nonsense. The priest's attitude had been offputting to say the least but, unfortunately, von Kasten was not in a position to deny the Church anything, not with his recent indiscretions at the count's feast still fresh on everyone's mind. Mocking the lord Sigmar in the presence of the local capitular was never a good idea, even if under the influence of seven glasses of wine. Still, while von Kasten had felt obligated to honour the priest's request, he in no way deemed it necessary to do a very good job of it. A band of crossbowmen who had never seen a real fight, the halberdiers under Kreyser who did most of their fighting in the local tavern, and a small number of knights who only answered the von Kasten's call to arms because he paid them well. The priest had said nothing when the men were presented to him, but his eyes had revealed quite plainly what he had thought of them. And so they had marched in relative silence, the priest too haughty to pay the men any heed and the men too discontent with this assignment for them to engage in any of their usual banter. The weather didn't help much; a typical Kaldezeit day, with cold winds, grey skies and muddy ground from heavy rainfall the night before. The cloying mud did little to improve morale among the troops, and at this point was starting to seep into the boots of most. Suddenly the priest halted, raising his hand to indicate the column needed to halt, before clenching his fist to further indicicate that they should form up. The men responded sluggishly- this was the seventh time the overly cautious priest had called for a formation, and each time it had been for naught. Annoyed, Lars looked at the village again- then saw something moving in the moring mist that hung over the hamlet. At first he thought they were but exceptionally big men, but then he realized that the distance was playing tricks on his eyes. The creatures lumbering about the hamlet were too big to be human- almost twice the size of a grown man, and possessed of a far wider girth. Two of them were riding some of the largest beasts Lars had ever set eyes on, and with them was a mob of greenskins which Lars guessed were goblins of some sort. The men quickly descended on the village, knights in front while the soldiers on foot followed. 'Brother Steimann, we cannot prevail against such brutes! Let us return to Wolfsbach and request additional troops; I have no doubt that lord von Kasten would deny us were we to bring him a report of this threat.' The sergeant spoke hastily but with more sincerity and respect now that he understood the gavity of the matter. Lars' shoulders sank- there was no talking to the priest. And besides, it was too late. Already he could see the ogres moving towards them, the two mounted monsters darting past their right flank, just behind a copse of trees. Not that many of the men noticed- they were far too preoccupied with the large brutes and the tide of greenskins directly in front of them. At this point the knights' impatience became apparent, as they charged into the ogres. Their valour eclipsed their fortune, however- despite the violence of the charge the ogres were all but unmoved. One died messily as a lance pierced its throat, but the others responded by beating the knights into a gory pulp. Their armour was no defense against the brutal clubs of the ogres, and within moments the knights were no more. Their deaths disheartened the men, but the unit musician's drum and stern looks from the warrior priest kept them in line. And when a hail of bolts cut into the greenskins, the halberdiers took it as a reminder that even monsters could bleed. Turn two for the Empire- rubber lance syndrome strikes again! Their confidence was short-lived, however. The hail of bolts did not slow the enemy's advance, and before Lars knew it he and his men were standing knee-deep in a mob of greenskins biting, stabbing and dying. 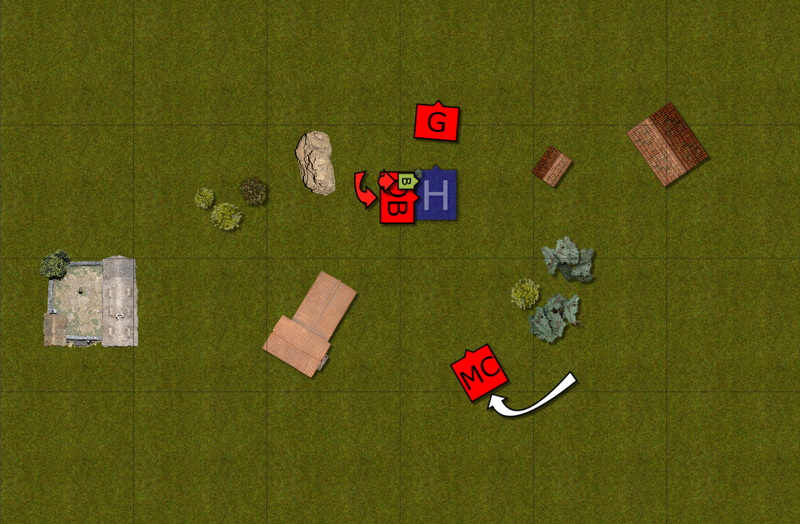 Two of the halberdiers were killed by random shrapnel being flung at them by the little devils, yet after a few minutes of frantic battle, the greenskins were routed, fleeing for the safety of having their masters between them and the halberdiers. Just then a terrified screaming came from behind the halberdiers- the ogre's cavalry had rounded the copse of trees and had slammed into the crossbowmen. Few dared to look back at their comrades, but those who did saw the young soldiers being messily dismembered by the ogres- or devoured by their mounts. End of turn 2- uh oh. 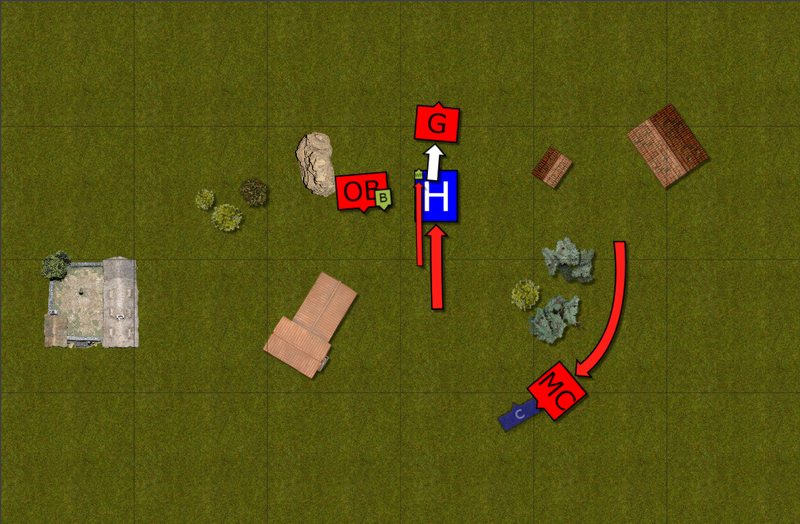 With Lars' halberdiers momentarily distracted by fleeing greenskins and dying comrades, the ogres took the opportunity to charge them. Before the soldiers could ready themselves the brutes were upon them, their heavy clubs crushing skulls and breaking bones. 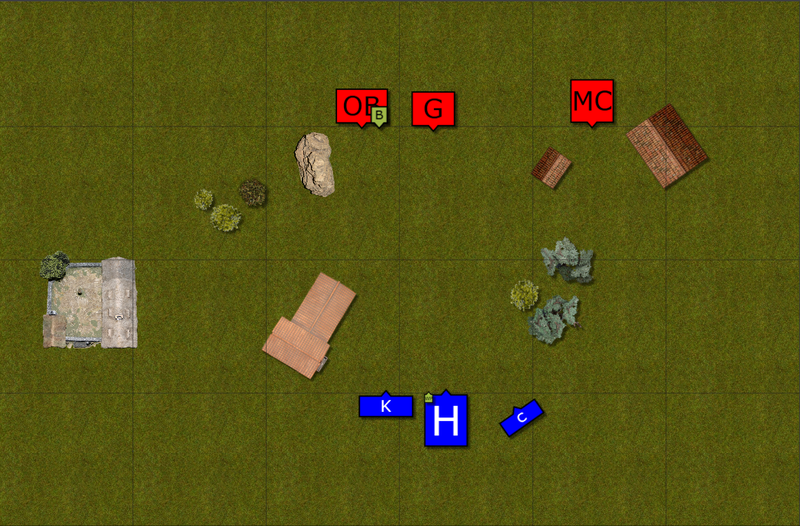 Amid the melee, the largest of the ogres leveled his club at his opponents. 'I am Thorg Silverhand Grumblegut! Fight me, humans!' Before Lars could respond to the ogre's challenge, however, the priest stepped forward, barreling into the ogre with a flurry of hammerblows. The ogre simply grinned, however, before smashing the hammer aside with his free hand and thrusting his club into the priest's ribs. 'That the best you got?' the ogre bellowed. The priest took several steps back, coughing up blood. Then he fixed his eyes on the ogre again and charged again and again, each time being repelled by the Bruiser who was evidently toying with the priest. And all the while, halberdiers were dying around them. Finally, Lars made a decision, to keep his men alive. He heaved his halberd, and brought it down with all his strength. On the priest's exposed neck. 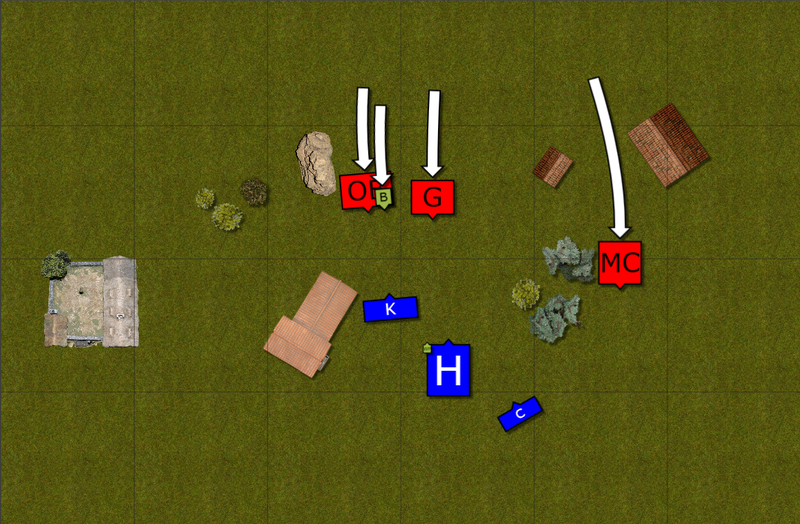 Brother Steimann gurgled, trying to turn around as he fell down, looking in disbelief at the sergeant's treachery. He weakly raised his hammer, then fell down, his lifeblood mixing with the dirt. Nobody moved or spoke- man and ogre alike stared at Lars. For a moment the sergeant said nothing, leaning on his halberd. Then he looked up at the ogre. The ogre looked dumbfounded for a moment, but then he laughed, his eyes gleaming with greed. End of turn 3/ end of game. Well that was quick. I enjoyed this! Nice to see a simple game of 500 points. 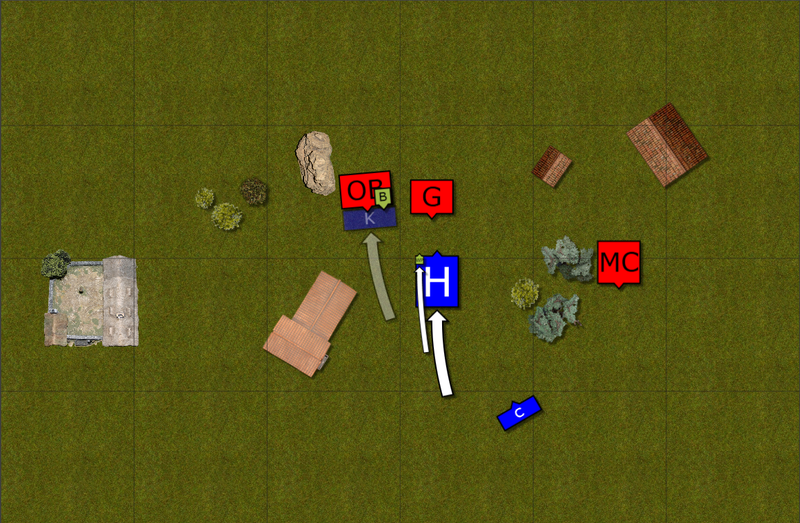 Did the good sergeant try to overrun the gnoblars, or did he restrain and reform and then STILL get beat by the ogres. So, what would you guys do if some dude came at you with a belt that way? Make sure I've got the safeword memorised. Thanks! The idea was for the halberdiers to overrun the gnoblars, and in the process run past the bulls to get out of their line of sight. Of course what actually happens is that the little buggers flee 11" while the halberdiers pursue 4"... Positioned perfectly for the ogres to countercharge and subsequentially butcher them next turn. Not that I was making sound decisions, mind you- should've sent the knights around the house to let them flank the bulls, rather than charging them head-on. Still, it was a fun game, and it's nice to get back to using my Empire army again . Great battle report really like the style! Love so more of those. Thank you all for the kind words !